The House of Commons chamber is not the first place you would look to find hip-hop dance moves. 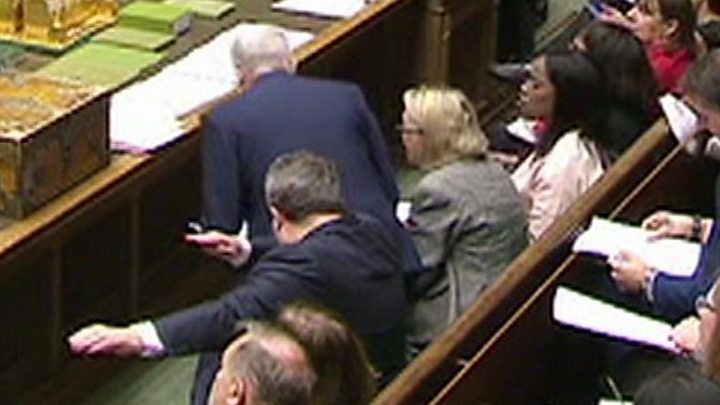 But Labour's deputy leader Tom Watson managed to sneak in a "dab" during PMQs as Jeremy Corbyn down next to him. The move - which swept the world after originating in the US hip-hop scene - resembles sneezing into one's arm. "Did I do a dab? I've been doing them with my kids in the holidays so I may have inadvertently done one," Mr Watson confessed to The Huffington Post UK. With his "inadvertent" move, Mr Watson follows in the footsteps of premier league footballers, Prince Harry and Hillary Clinton, who have all dabbed since the craze emerged. Dabbing involves the dancer dropping their head and resting it on one arm while simultaneously raising the other. Its birthplace can be traced to the Atlanta hip-hop scene, and it spread during 2015 as NFL players celebrated touchdowns with the move. Footballers including Manchester United stars Paul Pogba and Jesse Lingard brought it to a wider UK audience to celebrate goals. With all eyes on Mr Corbyn's tussle with Theresa May, Mr Watson's effort seemed to pass unnoticed by the massed ranks of MPs, and Speaker John Bercow - but thankfully the Commons cameras captured it in all its glory.